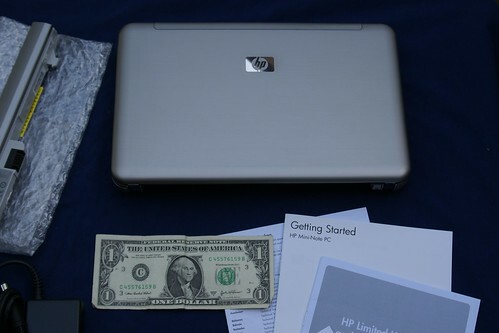 Last month I ordered an hp 2133 mini-note with pre-installed Linux, specifically Novell's SuSE Linux Enterprise Desktop 10 and it was back ordered until last week. Here are the obligatory unboxing photos. Man it is tiny, but after a few hours of getting use to it, it isn't *too* small for typing. I'm getting to like the button under the space bar that disables the touchpad for when you are doing extended typing. I'll be blogging more about this nice hardware as I explore it -- hw specs, restore CDs, installing Ubuntu/Hardy and Fedora 9, and any little hints along the way. Full Disclosure: While I do work for HP, it is not in any PC/notebook related area, although I do use Linux (RHEL4, OEL) on ProLiant servers on a daily basis. Also this a personal purchase for home use. I didn't even get an employee discount!